Babolat has finally released a few more versions to the Babolat Pure Strike line with the Babolat Pure Strike 18×20, the Babolat Pure Strike VS and the Babolat Pure Strike VS Tour. I wonder how consumers will be able to keep all these different Pure Strike models apart to be honest. The VS line replaces the Babolat Pure Control line so I guess they’re trying to reduce the number of paint jobs and racquet lines on the market. The reviews of the new Babolat Pure Strike has been glowing from the usual retailers such as Tennis Warehouse and Tennis Express, but some players have expressed concerns over stiffness. I had the chance to test the Babolat Pure Strike 16×19 and I must say it was a big improvement over the “boardy” Darth Maul version , but if you’re using a co-poly string it can be quite firm on tender joints. I think this is racquet that you either need to drop string tension quite a bit (I usually string around 22 kg but in the Pure Strike I might go even lower with the Solinco Hyper G – click to read my review) or try a hybrid of natural gut and co-poly such as the Wilson Champions Choice or the Babolat RPM Blast + VS which are both top-of-the line string sets if you want both feel and spin. Also, a softer poly like Solinco Tour Bite Soft or Luxilon 4G Soft might reduce the shock to the joints quite a bit. Like always, if you can, demo the racquet and be aware that the strings on the demo might be completely different from what you’re used to so you have to have a slightly open mind about the racquet’s performance. In the featured pic: Dominic Thiem is one of the players endorsing and using the Babolat Pure Strike. Hi, since pure strike is too firm for arm, would you recommend any other modern racquets that are more arm friendly? Thanks! * Prince Textreme Tour 100P – the Textreme series is arm-friendly yet crisp and has great feel. * Yonex DR 98 – This is very similar to the Pure Strike but with more flex. Great option. * Wilson Blade 98 with Countervail – This iteration of Blade 98 is more muted and comfortable than the previous. Worth checking out. * Head Graphene Touch Speed Pro – also a more muted option of a modern racquet. Might need a bit of lead. Let me know how it goes. If you have serious arm problems these might still be too stiff for you, but for most players looking for a comfortable yet modern option, the above frames should work great. I have both the Textreme Tour 100P and Pure Strike 18×20. I don’t perceive the 100P being more forgiving than the Pure Strike. If anything, the Pure Strike handles off-center shots better. I added silicone to the handle of my 100P to protect my wrist. Check out the Yonex Vcore Duel G 310. It’s similar to the above but more forgiving (less powerful though). The old Pure Control line would be worth a try. How does the Pure Strike compare to the old kblade 98? Many thanks for your posts, I am a big fan of your blog and I read it on daily basis. I am also a big fan of the babolat purestorm gt (2011), well, I was cause it is no longer in production. From my understanding, the new babolat pure strike vs (2017) looks like a very close successor (even closer than the pure control line). Any idea/guess on the main differences between the twos, if any? And if the potential stiffness issue you mention for the new pure strike line also applies to the VS, is there any more arm friendly alternative that comes to mind? Thanks for the feedback Alessandro! I really appreciate it. I’ve been reading your blog for a few weeks and I find it really interesting. Reading about the Pure Strike I noticed that Babolat specifies that the stiffness of the racquet is 70 RA, whereas Tennis Warehouse claims that its stiffness is 67. At first, I thought the Babolat stiffness was unstrung and the one in TW was strung, but I realised that the Pure Drive, for example, showed 72 RA in both websites. Do you know the reason for this difference and which is the rating I should take into account? I would like to clarify this to compare the PStrike with my PDrive. Thanks and congrats for your work! Thanks for the nice words! Sometimes they’re bit inconsistent when measuring strung vs unstrung. I think TW does it pretty well, but the Babolat official website I’ve seen mess up RAs in the past as well. The Pure Strike has 70 RA unstrung and around 67 strung. The Pure Drive has 75 RA unstrung and around 72 strung. Thanks so much Jonas for your blogs, I read them all the time! I replaced my pure storm GT tour with PS VS tour and strung it at 23.5kg poly (same as my GT tour) – it plays so much stiffer and I think I lost quite a bit of feel compared to my old one. Do you think your comment on the Pure Strike line stringing also applies to the VS tour? I am considering replacing the cross with Price synthetic gut at perhaps 25kg – interested to know your thoughts. I’m a doubles player and I like to step in on my return games – Angell TC97 16×19 or Ultra Tour sounds better? Greatly appreciate your help and expertise! The Angell TC 97 16×19 is slightly stiffer and more spin friendly. I think that racquet might work better for doubles than the Ultra Tour. Both are fine racquets however. The Pure Strike is a bit stiff, actually stiff enough for me to put it aside after initially playing some great tennis with it. I tend to recommend the Angell K7 Red to people who want a softer Pure Strike. The 2015 Wilson Blade is also a good option and I really enjoy the Prince Beast 98 too. 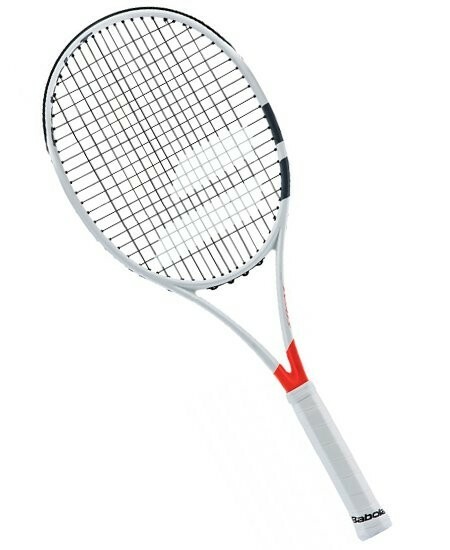 You could try stringing it with Alu Power Soft or Solinco Tour Bite Soft and adding some lead tape at 3 and 9 to increase stability. If you want more wrist comfort you could also add some silicone or blu tack inside the handle to dampen the vibrations. Which is the best option in the Pure Strikes line (or I’d put “most userfriendly” criteria – in my opinion are armfriendly and spinfriendly) do you think? And how the Pure Strikes compare to Aeropro line (on the criteria above as well)? I think the Pure Strike 98 16×19 is the best one. It is less stiff than the 100 sq inch option. I would not say it is particularly arm-friendly though so string it low or with a softer string in that case. The Pure Strike has a more controlled response from the stringbed and works better for flatter shots. The Pure Aero is a bit stiffer but will give you more spin and power. Hi mate great review of the racquet and I agree with you on many of your comments, especially about dropping the string tension on this particular racquet (I’m using rpm blast btw). Just wondering, I’m finding this racquet rather light in the head to swing through the shot (even at 310 grams with lead tape), do you think I should bump up the weight more/put the weight in the head of the racquet in order for it to become more powerful/create more plough through on the swing. Also would you recommend another string for spin? Thanks! Yes, some more lead in the head can work wonders. Will make it more stable. If you already have lead at 3 and 9, you could add 2 grams at 12 o’ clock and you might experience a positive difference. I loved Solinco Hyper-G in this racquet. If you want something softer, HEAD Hawk Touch is a good choice. Hi, I like your reviews a lot, very much unbiased. I’m between a strong beginner and an intermediate player. I always played with Head Ti-S6 and felt my game is not improving and my elbow and mid-arm are sore for a couple days after the game. I played with K-factor before and my wrist and palm were sore for over a week and half. I tried the babolats once and felt they are very stiff and I was not used to head light racquets, so I gave up and went back to my TI-S6. Now I’m looking to upgrade to a better racquet. So 2016 pure strike, 2015 Pure Drive (only available with midwest sports) and New Wilson clash are my choices. your recommendations are valuable. Thanks a lot in advance. Thank you for your website. Amazing source of knowledge. I have a question regarding demo version of Project 17 the one they used to ship to various distributors, players, coaches. Is it a stock version with a different paintjob or something ‚special’?